Soufriere Hills Volcano dominates the southern portion of the beautiful Caribbean island of Montserrat. Its last major eruption was in Feburary 2010 but for the 15 years before that it must have been one of the most changeable mountains in the world! It grew and collapsed a series of lava domes that overwhelmed the previous feature of English’s Crater. This activity sometimes generates pyroclastic flows, volcanic explosions and ash. The volcano is monitored by the Montserrat Volcano Observatory. A ‘Vulcanian’ explosion from Soufriere Hills Volcano. Notice that as well as producing an eruptive column this is producing fast moving pyroclastic flows, travelling down some of the valley. Photo Barry Voight and courtesy NSF. The stratovolcano of Soufriere Hills is part of the Lesser Antilles volcanic arc, formed by the subduction of the North Atlantic plate under the Caribbean plate. This region has several active volcanoes, many of which erupting causing significant disruption in the twentieth century. Soufriere Hills Volcano and Montserrat is a study setting for the STREVA Project. We are interested in the long term changes and impacts as a result of the eruption. A terrific range of data and observations have been made of the activity and we are also interested in how that can be used to improve how we understand and forecast volcanic activity. You can also see a video we made of Montserratians talking about the eruptions and their impact here. Although it has not had magma erupt at the surface for a few years, it remains in a state where this could possibly happen again, with only a short warning. Height – 1,110m This statistic has changed almost continuously since the onset of the recent eruptions in 1995! It has remained static for the last few years. This is a false-coloured ASTER image from NASA to show the deposits from the major dome collapse in Feburary 2010. This shows very clearly how the flows generated tend to follow valleys but their hugely energies mean that they do not entirely remain in those valleys – spreading further. These flows only affected the uninhabited southern portion of the island. Image courtesy of NASA. Explosivity – 3. The Soufriere Hills Volcano was little studied prior to the current eruption, and this is the size of the larger eruptions during the current episode. It has eruptions of this size several times during the current episode. Deadliness – 1. 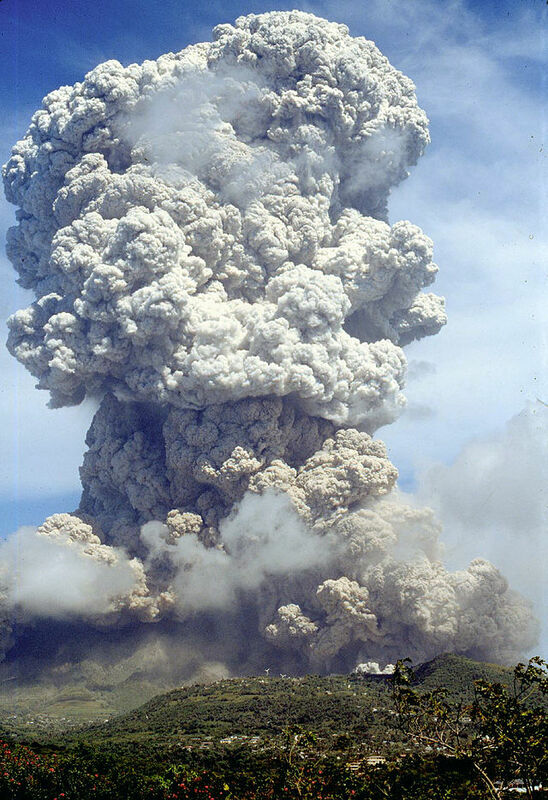 The most infamous eruption of Soufriere Hills occurred on the 25th June 1997. A major dome collapse engulfed new areas of the island and tragically killed 19 people. Wow! Factor 84 – The relatively high score in this category come from a volcano that dominates the southern skyline of the small Caribbean island of Montserrat. This makes for an imposing edifice (when it peaks out from its orographic cloud). Soufriere Hills comes to life at night during phases of dome growth; cascading flashes of red hot rock can be seen tumbling down from the very top of the volcano. Unpredicatbility – 17. With its relatively short eruption record and eruptions reaching a relatively modest VEI of 3. The range in eruptive activity although large for a small island is not as dramatic for some other, larger systems. Devastation potential – 223. Although people do live in close proximity to the volcano, it is unlikely they could be affected. The relative amount is limited by the size of the island’s population. 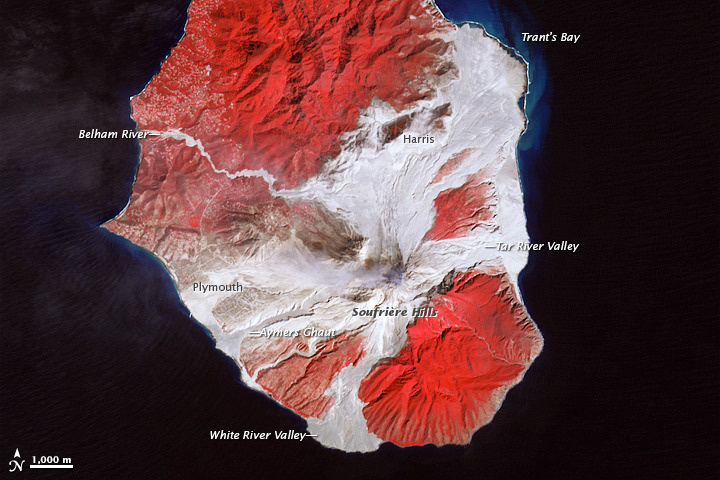 The long-lived Soufriere Hills eruption has been extremely well studied worldwide. However, the citizens of Montserrat are rightly proud of the way in which they have coped with the impacts of the eruption. Over 5000 people continue to live in the north of the island. This is currently a strong focus of re-generation. Sir George Martin (the record producer for the Beatles) opened and ran ‘AIR studios’ a recording studio that played host to Paul McCartney, Elton John and Stevie Wonder among others. Although now destroyed by the eruption George Martin used the sales of limited edition lithographs of the score for ‘Yesterday’ to raise funds for a new cultural and community centre in the north of island. The Video here was shot in Air Studios and around the island of Montserrat in the 80s before the volcano erupted.